Stupid nut allergies have prevented me from trying some foods over the years that look, smell and no doubt taste amazing. Pesto was one of the things I had wanted to try for years, but as it contains pine nuts, it is a no go. I had a moment of genius (or madness, I can never really tell the difference) and figured that I could replace the pine nuts with something else, after a little trial and error, I found a combination that worked. My taste tester assures me that the flavours are in the same balance as normal pesto made with nuts the only difference is the texture of the sunflower seeds, I suppose I have to take his word for it because I do not fancy the hospital trip that I would get if I checked. The baby kale adds a new dimension of flavour that works well with eggs. If you do not have to avoid nuts sub, the sunflower seeds for the same amount of pine nuts. 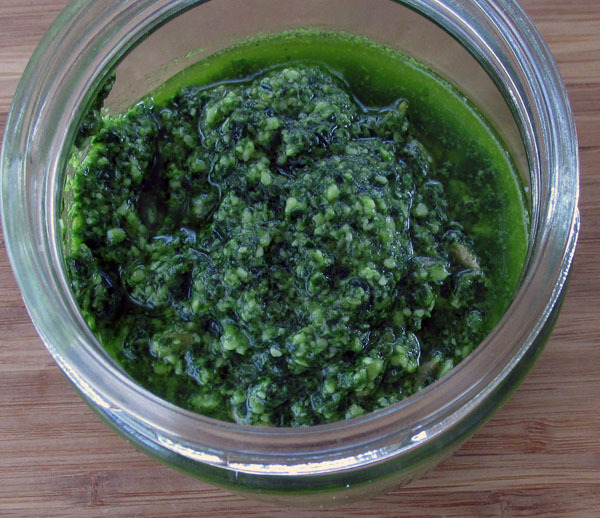 In a food processor pulse the garlic, a pinch of salt and the kale leaves. Add the sunflower seeds to the mixture and pulse again. Add half the parmesan to the processor and pulse again. Turn the processor on a low speed and add in enough olive oil to bind everything together. Add a little oil at a time, so you don't drown everything else.